The rapper has a plan for black Americans to take back control. 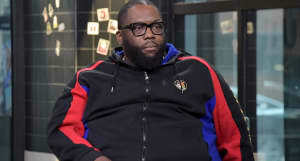 In an engaging and powerful 15 minute sermon, Killer Mike spoke to Hot 107.9 FM in Atlanta's Mz Shyneka about how the police shootings of Alton Sterling and Philando Castile left him feeling. "I'm angry, I'm hurt, I'm disgusted. I'm ashamed to be a part of this country," he began. "It is time to get angry and do something." Killer Mike, whose father was a police officer, showed his appreciation for the police officers in his home city of Atlanta. "In Atlanta, we have a police force that's subtly different from some I've seen around this country... Nothing is perfect, but I just wanna first salute some of the officers that we have on ground here... 15 minutes, 15 miles outside of Atlanta, I'm afraid I'm going to be murdered [by police]." He also discussed his idea of boycotting the corporations we do business with every day who do not support the cause of ending police violence against black Americans. "You can go to your bank tomorrow and you can say 'Until you as a corporation start to speak on our behalf, I want all my money. And I'm taking all my money to a citizen's trust'...It works. Apartheid ended in South Africa because students said 'We're not flying Delta anymore. We're not drinking Coca-Cola anymore. We're not supporting any corporation that supports the apartheid and enslavement of people who look like us.'" As he finished, Mike touched on the importance of allies. "Every step of our step for rights... we had allies who didn't look like us." Watch the entire speech above. A rep for Killer Mike did not immediately respond to a request for comment.